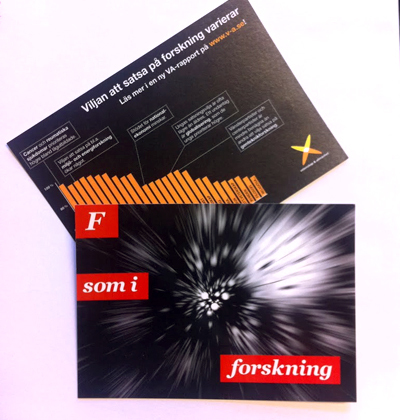 A postcard with a clear message and interesting graphics can be an attractive way of communicating information about research and science. Preparations: Design the postcard and decide on the appropriate amount to be printed. Market the activity. Challenges: Finding a message that can be communicated in an attractive and interesting way using the limited space on a postcard. Benefits: A good way of communicating a concise message in an attractive way. Visitors can take information home with them. The postcard will remind them about the event and they can send the postcard on to others. Postcards can also be distributed by email and can then provide links to more detailed information.